NEW!! ITASCA (U of MN)- With lower acidity and higher sugar levels, Itasca produces a wine that is light yellow to straw in color and has aromas of pear, quince, violet, melon, minerals, and subtle honey notes. LA CRESCENT - (U. of MN) Makes a wonderful white wine with an apricot-pineapple flavor. The fruit turns a beautiful golden brown when fully ripe. The vine is a vigorous grower with a very attractive dark green foliage. You must have a good spray program to manage downy mildew. This wine has unlimited marketabilities. FRONTENAC GRIS - (U. of MN) This is a mutation of Frontenac. Excellent winter hardiness and vigor. The fruit is a light lavender-bronze color. All plant characteristics are the same as Frontenac. When pressed without a skin time the juice is a cherry pink. This wine has a more complex taste structure with strawberry-apricot tones. This wine is a nice amber-gold color with fresh fruit aromas. There are many ways to use this grape in your winery. PRAIRIE STAR - (E.S.) Very good winter hardiness. This grape has good vigor, but it tends to start out slow the first year or two. Then it comes on strong. 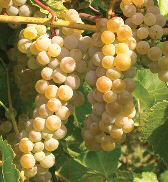 This grape makes a more neutral wine, has good body, and is often used in blending. Very nicely clustered berries. Brianna - (E.S.) This grape has good vigor. We are still testing to see how far north it will go. At this point it seems to be hardy up to the Twin Cities metro area. This grape makes a very nice semi-sweet table wine with a honey-apricot-peach taste. A very, very nice fruity nose. This wine has a lot of marketing opportunities. PETITE AMIE - (Dave McGregor) This grape has nice size clusters. It was developed in Central Minnesota so the winter hardiness is good. It has slow plant vigor. The wine has a very nice floral nose to it. ST. PEPIN - (Elmer Swenson) St. Pepin has a very fruity flavor. It makes a nice white wine or ice wine. EDELWEISS - Edelweiss is very popular in the Midwest.